Researchers have often assumed that only circumstances within national borders influence fertility decisions. In an integrated Europe, however, people may know about and compare conditions across countries. 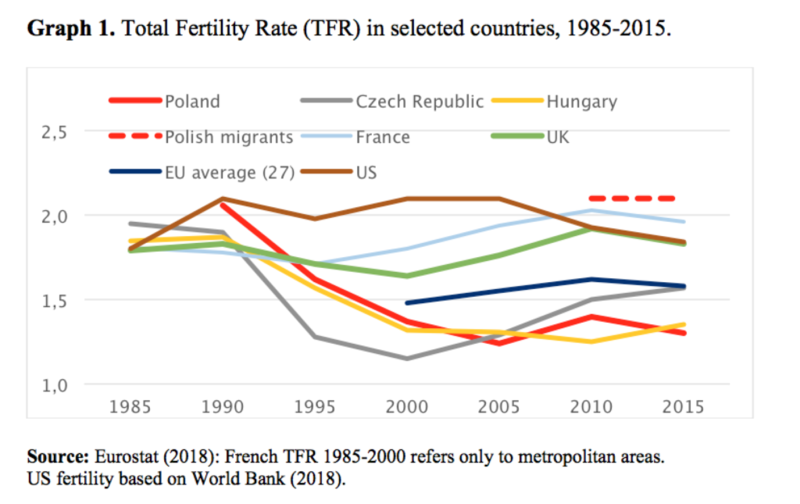 At least in the case of Poland, according to Joanna Marczak, Wendy Sigle and Ernestina Coast, such comparisons may help explain why, despite policy efforts, fertility has remained very low in the past fifteen years or so. Concerns about low fertility and population aging have triggered considerable interest in whether and how family-friendly policies can increase fertility. 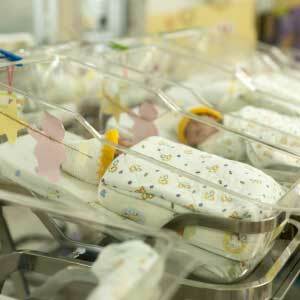 Drawing on evidence that desired fertility exceeds actual fertility in many low-fertility countries, the European Union (EU) has promoted a policy agenda to reduce childbearing costs, to help citizens realize their fertility desires (Davies, 2013; European Commission, 2006; Frejka et al., 2008) Despite this agenda, total fertility rates (TFRs) have remained very low in Central and Eastern Europe (CEE), although migrants from the region have higher fertility abroad (see Graph 1). While researchers and policy makers often assume that individuals only consider circumstances in the place they currently live while making fertility decisions, and argue about the adequacy of nationally implemented fertility-enhancing policies, in an interconnected Europe, nationals are likely aware of circumstances abroad and compare conditions across countries. Such international comparisons, and the feelings of relative deprivation or advantage that result, may influence how people evaluate and respond to “family friendly” policies. At least, this is what seems to emerge in the case of Poland. What our research tries to explain is why the TFR of Polish migrants in the UK (2.1 children per woman) is higher than the TFR in Poland (1.3), and higher than the TFR of UK born women (1.8). Poland’s TFR has remained very low since early 2000s, despite numerous family-friendly policies introduced since the mid-2000s, such as extended paid maternity and paternity leaves, birth grants, more generous universal cash payments for families with children, and more childcare places. Besides, c while the UK has quickly become one of the main destination countries for Polish migrants (see Graph 2). Thus, the Polish context allows us to explore whether individuals consider circumstances in other countries when they take their childbearing decisions, even if they are not actively seeking to migrate themselves. In a recent study (Marczak et al., 2018) we explored whether and how cross-national comparisons inform decisions about childbearing in contemporary Europe by comparing Polish nationals living in Poland (Krakow) and the UK (London). Data were collected until a point of saturation was reached, and no new information was provided (Kvale and Brinkmann, 2008). The sample included 44 individuals: 13 mothers and 9 fathers in London, 11 mothers and 11 fathers in Krakow (see table 1). We ensured a similar number of individuals with certain characteristics (e.g. similar educational status) in both cities. Respondents were recruited purposively through advertisements in local newspapers, online fora and in Polish shops and churches in London. By conducting in-depth, semi-structured interviews (44), we gathered detailed information about the complex factors that were important when parents of one child considered having another. In the course of the interviews, respondents spontaneously used cross-national comparisons to justify their childbearing intentions. Although not specifically prompted to consider cross-national comparisons, 16 out of 22 respondents in Krakow and 18 out of 22 in London made such comparisons of family-friendly policy packages, wages, living standards and more broadly family-friendly contexts when talking about their childbearing choices. Conditions in Poland were often evaluated using West European living standards (wages, material and housing conditions) as a benchmark, particularly when describing what parents feel they need to provide for their children. Living standards were often reported to be much lower in Poland than in West European nations, childrearing costs were deemed high and state support for raising children considered inadequate, relative to that offered elsewhere in Europe. Respondents often reported that they felt relatively deprived in Poland compared to what they perceived was available in other, richer European countries and used such cross-national comparisons to explain why they had decided to delay or avoid having another child. Individuals reported detailed, although imperfect, knowledge of disparities in living standards and policy contexts between different EU nations. Eleven out of 22 respondents in Poland had some personal migration experiences, many had family members and friends living abroad, many also referred to media coverage of cross-national differences in living standards and social support for families. Through these contacts, respondents formed an idea of differences between different European countries. In London, respondents often compared living standard and state support for families between Poland and the UK and expressed relative satisfaction with their living conditions. They explained that it was easier to provide their children with necessities because of lower costs of living relative to wages, and better state support for families with children. Respondents in London felt relatively advantaged (compared to Poland) after migrating, even if they were relatively disadvantaged in their new context compared to natives. Such perceptions of relative advantage, if typical of migrants from other CEE countries, may help us to better understand reasons behind higher fertility levels of migrants from this region. Our data suggest that cross-national comparisons, at least in certain cases, may shape the way people evaluate living standards and childbearing costs. In highly migratory contexts, such as Poland, individuals may not assess living standard and policy innovations against the recent (national) past, but instead compare them to the circumstances prevailing in other nations they could move to. Indeed, Polish immigrants to the UK tended to compare their circumstances in the UK to those they enjoyed in Poland, although they usually left other, sometimes more generous, European countries out of the picture. Although our findings focus on Polish nationals, they may have broader implications for understanding fertility in increasingly interconnected societies. Although “Brexit” is likely to pose restrictions on migration between the UK and EU, easy and cheap travel within Europe permits relatively easy relocation for leisure, visiting relatives, and employment for EU citizens. Importantly, European integration has brought unprecedented opportunities for cross-border exchanges of social, political, cultural and economic ideas and practices. As the spread of Western standards becomes ever more present in shaping desired living standards globally, we suggest that cross-national comparisons may become increasingly salient for the ways in which individuals think about future fertility. Eurostat (2018). Population and social conditions: Fertility indicators. Frejka, T., Sobotka, T., Hoem, J. M., & Toulemon, L. (2008). Childbearing trends and policies in Europe. Demographic Research, 19 (Special Collection), 1–46. Kvale, S., & Brinkmann, S. (2008). InterViews: Learning the craft of qualitative research interviewing (2nd ed.). London: Sage Publications. Statistics Poland (2018) Main directions of emigration and immigration in the years 1966-2014 (migration for permanent residence). World Bank (2018). DataBank: World development indicators.